Most head coaches would have punted, especially given the way the other team was moving the ball. Tied at 24-24, and facing a fourth-and-two at the Air Force 42 with just 38 seconds left in the fourth quarter, Jim McElwain was having none of that. Rather than punt and pin the Falcons deep in their own territory with an eye on trying to win in overtime, McElwain gambled – and lost. The Falcons stuffed the run before moving deep enough into CSU territory to kick a game-winning field goal as time expired. The loss left CSU with a still glistening 10-2 record and with Boise State winning the next day, ended up having no real impact on the Rams bowl destination. Still, at that moment, winning could have meant a shot at playing on New Year’s Day. The fact that McElwain was willing to take a risk with so much on the line tells you all you need to know about how and why he was able to do amazing things during his three-year tenure at Colorado State. You don’t win if you’re just there to participate. For a coaching “lifer” who had been an assistant everywhere from Montana State to Michigan State to Alabama – and even spent a year with the Oakland Raiders – challenges and risks are nothing new. In December, he decided to take on his biggest challenge yet when he left CSU for a chance to coach in the SEC at Florida. Once again, McElwain was not taking the easy way out. It will be an immediate test. Of all the attributes that make a great college football coach, one of the least publicized is the ability of a new incoming coach to blend “his” recruits with the players that were already on the roster when he arrived. It not only makes for a more rapid turnaround, but it goes a long way toward establishing a long-term culture of winning. When he came to Fort Collins in January of 2011, McElwain wasn’t buying into the notion that it would take four or five years to taste success. Fresh off a second national championship as the offensive coordinator at Alabama, the Rams new head man immediately embraced the players that were already on the CSU roster, those recruited by former head coach Steve Fairchild. After improving to 4-8 in his first season, McElwain took a roster still made up mostly of Fairchild recruits and won 8 games – including a bowl game win over Washington State to close out 2013 – and followed that up in 2014 with the school’s first 10-win season since 2003. With wins over “Power Five” conference foes Colorado (Pac-12) and Boston College (ACC) and a nine-game winning streak, the Rams broke into the national rankings and remained in contention for a New Year’s bowl bid until the final weekend. Now, McElwain will face the same challenge – only under a much brighter spotlight – to blend the current players brought to Gainesville by former coach Will Muschamp with new recruits he brings in. Here’s betting that the players already at Florida embrace him instantly. 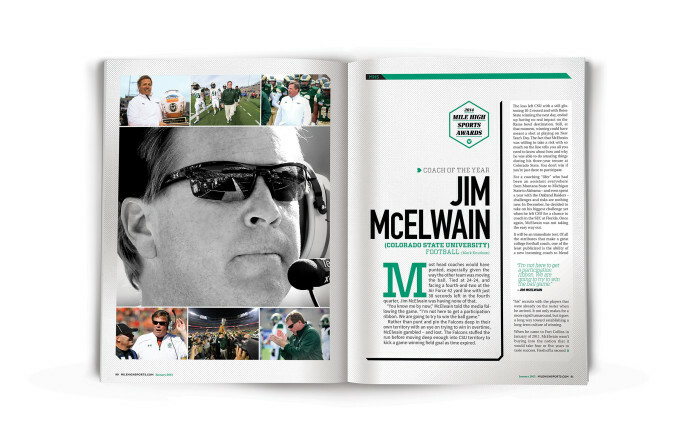 For his stellar work this season at Colorado State, Coach McElwain is Mile High Sports Magazine’s 2014 Colorado Coach of the Year. There is little question that his tenure in Fort Collins will be viewed as a crucial time in program history, a time of rapid growth and achievement. He is the first CSU head football coach ever to be solicited to leave the school for a more high-profile job, which is a newfound sign of respect for the program as a whole. Gone but not forgotten, Jim McElwain will be remembered by football fans in this state as the guy who made CSU football nationally relevant. When CSU-Pueblo decided to bring football back from the dead in 2007, they turned to former player and graduate assistant John Wristen for help. He accepted the head-coaching job, and beginning play in the Rocky Mountain Athletic Conference in 2008; it took just three seasons to become champions of the RMAC. This season, his seventh year back at his alma mater, Wristen took the ThunderWolves to new heights by winning the NCAA Division II National Championship. Since 2011 – when Wristen was named National Coach of the Year, CSU-Pueblo has been the state’s best football program, reaching the NCAA playoffs every season, including spending time as the top-ranked Division II team in the nation. Normally Hall of Fame athletes don’t make terrific coaches. Icons like Wayne Gretzky or Magic Johnson have tried and famously flopped. Patrick Roy is an exception. Rather than resting on his Hall of Fame laurels or heading into the broadcast booth, Roy jumped into coaching in the Quebec Major Junior ranks – among the highest level of “minor” leagues in Canada – before the Colorado Avalanche brought him back to the organization prior to last season. The result was one of the most amazing turnarounds in NHL history. 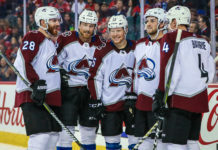 After having the first pick in the draft following a disastrous 2011-12 season, the Avs shocked the hockey world by winning the Central Division, racking up 52 wins and 112 points. Roy was given the Jack Adams Award as the NHL Coach of the Year. The epitome of “local boy done good,” Cherry Creek high school football coach Dave Logan has set a new kind of standard for coaching success in Colorado. The Wheat Ridge native and former University of Colorado and Cleveland Browns standout finished his third season as head coach at Cherry Creek with an epic victory over Valor Christian, a 25-24 thriller that saw Logan opting for a game-winning two-point conversion with just 5:09 on the clock. Successful, the decision earned the school’s eighth state football championship. More amazing is the fact that Logan, the radio voice of the Denver Broncos and three-time Colorado Sportscaster of the Year, has now won seven state championships at four different high schools. There is no offseason anymore for Nick Frasersmith. As the head coach of the Regis High School girls’ swimming team, his teams have won four state titles since his arrival in 2003. He coached Olympic champion and local icon Missy Franklin. 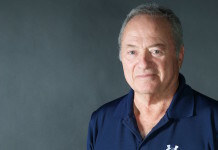 Now this year, Frasersmith added the task of leading the boys’ program as well, trying to fill big fins of legendary coach Michael Doherty, who won 20 state titles and amassed a 20-year, 234-meet winning streak before retiring. On the heels of winning another girls’ title in February, Frasersmith’s Raiders added another title to his résumé when the Regis boys captured their fourth straight title last spring. University of Colorado cross country has become synonymous with winning on a national scale. Since he became the head coach in 1995, Mark Wetmore’s Buffaloes have won seven national championships, two on the women’s side and now five on the men’s. In 2014, the top-ranked Buffs men’s team completed the second of back-to-back national title runs with a sensational 65-point effort at the NCAA Championships. It was the lowest (best) team score at the national finals since 2005. The Buffs top five runners all earned All-American honors. Wetmore is the only coach in NCAA history to win all of his cross-country titles at the same school.